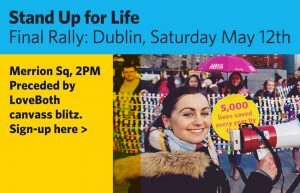 Last chance to “Stand up for life” at monster rally in Dublin today. Five former chairs of the Institute of Obstetricians and Gynaecologists have called on the Master of the National Maternity Hospital Dr Rhona Mahony to withdraw comments she has made about the medical healthcare of pregnant women. The five former Chairmen of the Institute of Obstetricians and Gynaecologists – Prof John Bonnar, Dr Eamon McGuinness, Dr Conor Carr, Dr James Clinch and Dr Michael O’Hare – write that these comments “are simply not true. We call on them to withdraw these statements. “Ireland is a very safe country in which to be pregnant. The Eighth Amendment does not prevent Irish women receiving care of the highest possible standard. This is why our maternal death rate is so low. 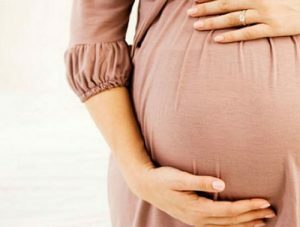 Recent Maternal Death Enquiry reports confirm that Ireland is one of the safest places in the world to be pregnant. If the public vote Yes in the referendum, say the obstetricians, “it is the stated intention of government to introduce legislation to enable ending the life of a perfectly healthy growing baby, in a perfectly healthy pregnant woman. That is a matter of conscience for each voter. What this referendum is not about, and what it has never been about, is maternal healthcare,” they conclude. Meanwhile, in the centre of Dublin city today, the Stand Up for Life rally will take place at 2.00 pm in Merrion Square. This will be the final rally before the referendum of 25 May. Before the rally, a LoveBoth canvass blitz is happening across the capital form 11.00 am to 1.00 pm. Loveboth, the organisers of the rally, are calling on each person coming to the rally to bring along three friends.